In less than two years, Big Waves of Pretty has proven themselves as nomadic DIY road warriors that seemingly live nowhere and everywhere all at once. Birthed on a dirt-road farm in Highland, Wisconsin, the group exists almost exclusively as an entity that writes and records on tours that stretch across the seasons. The constant shifting of circumstances the boys find themselves in lends to their distinct style of intricate drumming and interweaving guitar parts. Frantic, jutting patterns collide into a sonically expansive mutation of pop music that defies classification. The songs written and performed on their 100+ date 2013 U.S. tour form “It Is A Sight He Never Forgets,” a clever commentary on the irreverence of twentysomething youth culture, long drives on summer nights, and sitting out on the lake with your dog, boombox and best friends. 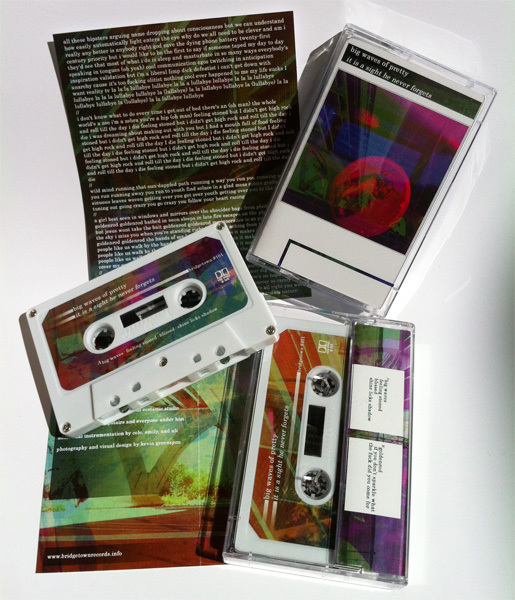 Edition of 125 pro-duplicated chrome cassettes with full-color labels and doublesided printing on heavyweight gloss stock, includes digital download and foldout lyric sheet.